One of the big questions that our customers often ask us is “Which websites are worthwhile listing on?” so the team at Marketing4restaurants decided to slice and dice our data for April and discover which websites are referring the most traffic to our customers. The 6 websites that are most talked about are Dimmi, Eatability, Yelp, Tripadvisor, Australian Good Food Guide and Urbanspoon. This report only covers these websites. 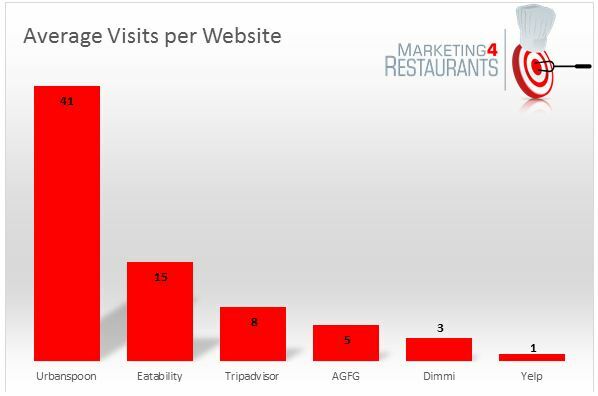 The first graph shows the % of restaurant websites that received traffic from each of the 6 websites. 50% of restaurants in the sample received traffic from Urbanspoon and 38% from Eatability. Australian Good Food Guide referred traffic to 40% of the restaurants in our sample. 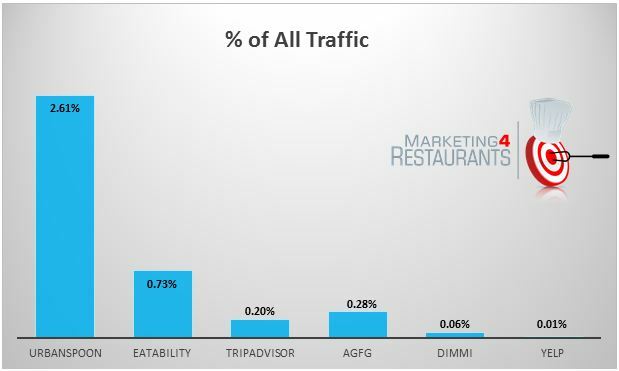 Tripadvisor made referrals to 19% of restaurant websites and Dimmi and Yelp provided visitors to just 13% and 10% of restaurants in our sample. This is not an indication of how many restaurants are listed on each of the referring websites as some websites are more popular than others and some make it easier to click through to a restaurants website. As pointed out in a previous report, referral traffic is the 3rd in importance after direct entry, which is a combination of people going directly to the website and those coming from emails, and Search Engines. Links in other websites are important though, because they are part of the way that search engines determine how important each website is and how to rank them. This graph shows the percentage of traffic that comes from each of the referring websites as a percentage of all referral traffic. Of all of the referring traffic, which is websites that have links to restaurant websites, Urban Spoon referred by far the most traffic to our customers. This is partially because many of our customers are listed on their site, partially because of the amount of traffic that Urbanspoon receives and partially because of the ease with which it is to find links to each restaurants website on their listing pages. 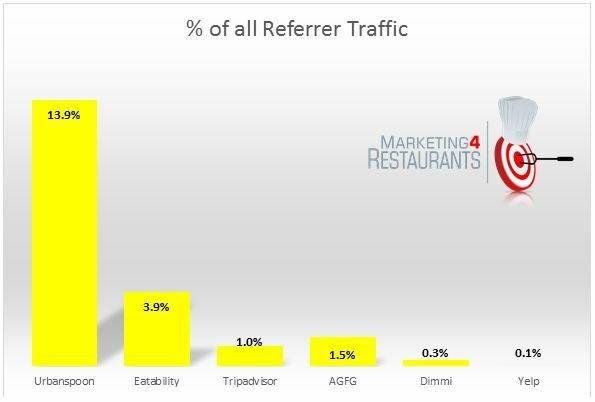 When looking at this graph, the traffic received as a percentage of all of the traffic from just referring websites implies that there are a large number of other websites that refer a significant amount of traffic to restaurant websites. In fact, the 6 websites listed here referred just 20.7% of all referral traffic. Many restaurant owners are unaware of some very successful websites that referral a lot of traffic to a select few restaurant websites. Most importantly this is the number of visits for each website. The data shows that on average Urbanspoon referred 41 visitors in the month to each of our customers’ websites. Customers using Dimmi receive on average just 3 visits in the month. This is partially explained by Dimmi’s business model which is to generate restaurant bookings, but one interesting question is how many people want to look at the restaurants website first to see if they would like it. Although Yelp has only been in Australia for 12 months, it just announced that it had reached 1,000,000 unique visitors. Yelp does cover a large number of industries and the traffic may be spread thinly and people may not click through, but it is unusual that so little traffic is referred to restaurant websites. Some popular business scored very low for referring traffic to the restaurant websites. Sensis referred virtually no traffic. Yellow Pages on average referred 8 visitor is per month to a low number of restaurant websites. This would be disturbing if the restaurants had paid Yellow Pages online advertising. Having a look at the site, Yellow Pages has a large number of restaurants listed but very few have the website addresses listed. One fact that became very clear when looking at the traffic was that 30% of the restaurants received 80% of the traffic from referrals. Some restaurants had over 20 separate websites referring significant numbers of visitors to their websites and this made a significant difference to their overall traffic numbers. Restaurant owners and marketers should definitely ensure that they are listed in Urbanspoon and Eatability. Listing is free and your website will receive more traffic. Links into your website are important because it helps the search engines to determine how to rank websites in their search results. Make sure that your listing is up to date and also has your website listed. We noticed that some restaurants in Urbanspoon had a listing but their website was not listed, and as such, they received no traffic from Urbanspoon. Our next report, “The most important type of Website Referral Traffic for Restaurant Owners” will be sent to our existing customers first and only a cut down version will be released to the public as the websites covered in that report refer significantly more traffic to restaurant. These websites are significantly more important than the national directory sites. We took a sample of the restaurant websites who we provide Website, Online Bookings or Market Intelligence services and analysed the traffic. This report covers the 6 websites, Eatability, Urbanspoon. AGFG, Tripadvisor, Yelp and Dimmi. It does not cover all of the other websites who referred traffic to our customers, nor traffic gained from search or direct entry. 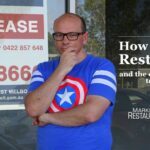 Marketing4Restaurants.com provides restaurant owners with the most cost effective way to find new customers and turn them into repeat customers. Our online booking feature is saving many restaurants thousands of dollars every year. By using Microsoft’s Azure technology, we are able to provide Big Data solutions to Small Business owners, ensuring that our customers know more about how effective their marketing is. 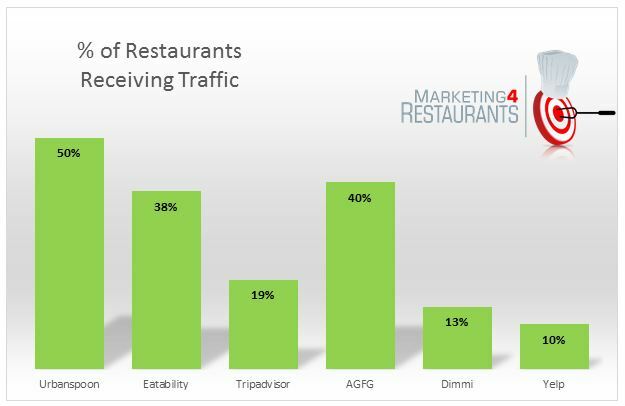 Sources of Traffic for Restaurant Websites: Where do all of the customers come from?